Aluminum Anodizing, Aluminum Hardcoat | Remote Controls, Inc.
Parts Manufactured from Aluminum offer many benefits. Aluminum is abundant, economical, lightweight, and machines easily. Additionally, the surface hardness, wear resistance and corrosion resistance of Aluminum can be greatly enhanced by chemical and electrochemical processes. These processes are generally divided into “ANODIC COATINGS OF ALUMINUM” and “CONVERSION COATING OF ALUMINUM.” These are discussed in further detail below. Anodic Coatings are formed in an Electro-Chemical process. The part being processed is immersed in an oxygen-rich electrolyte and becomes the ‘Anode’ of a DC Electrical circuit. Under these controlled conditions surface molecules of Aluminum are transformed into molecules of Aluminum Oxide. This process is highly flexible, applicable to singular prototypes or large runs of products. Process VERIFICATION is assured by use of routine testing of Process Solutions (Chemistry and Temperature) and uniform Process Sequences. Process VALIDATION, assures our coatings meet established PERFORMANCE CHARACTERISTICS including Coating Weight, Corrosion Resistance, Wear Resistance. MIL-A-8625 is considered the Controlling Document for Anodic Coatings. 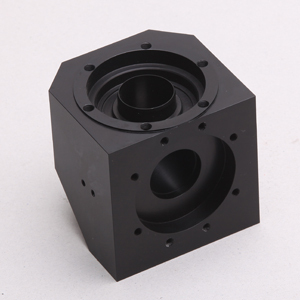 It defines the Performance Requirements for each TYPE and CLASS of Anodize. All other Commercial and Customer Specifications follow the format and guidelines of this document. Produced in dilute Chromic Acid solution, this anodize provides a thin film approx .0001 to .0004 thickness. Since only 1/3 of the thickness is "growth" Chromic Anodize is an excellent choice for close fitting assemblies. • Most Commonly DYED Anodize. Can be dyed to a variety of colors. 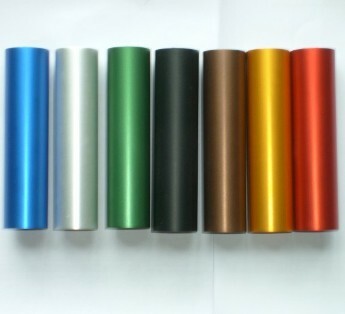 Anodized surfaces are normally "sealed" to improve corrosion resistance, and/or lock in dyes. RCI offers the following Seal Options: Hot Water, Teflon, Nickel Acetate, and Sodium Dichromate. The most commonly used alloys, Series 5000, 6000, and 7000 all produce excellent finishes. Alloys with high concentrations of Copper, Silicone and/or Magnesium, however, produce less desirable results. The 2000 series (2024 for example), with its high copper content, is often prescribed because of its superior strength characteristics even though there are challenges involved in processing. Therefore it is extremely important for us to know the exact alloy when performing the “Hardcoat” finish on your product. We offer both a traditional Chem Film process as well as a RoHS compliant hex-free process. The formation and properties of Chem Film finishes are described in the controlling document MIL-DTL-5541. All other customer specifications follow the format and guidelines of this document.